An Iranian reporter has been killed in the embattled Syrian city of Aleppo amid fierce fighting between the Syrian forces and terrorists in the flashpoint city. 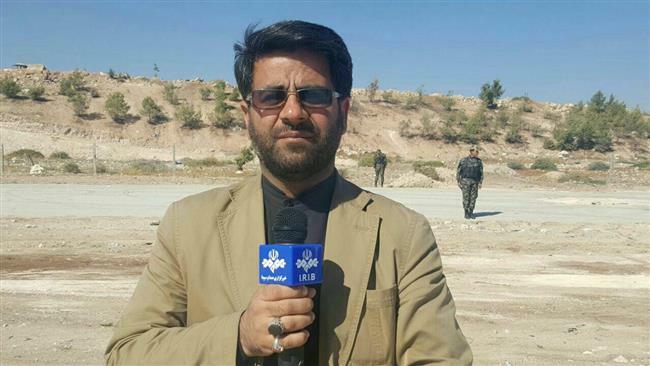 Mohsen Khazaei, who worked for the Islamic Republic of Iran Broadcasting (IRIB), was killed on Saturday while his cameraman sustained injuries and was transferred to hospital. The Iranian reporter lost his life when shrapnel from a mortar shell hit him in the head. His cameraman, Tamer Sandooq, was injured in the shoulder. The Iranian reporting team came under mortar fire by terrorists in Minyan district in the western part of Aleppo. A number of correspondents affiliated to Iranian news stations have fallen victim to the conflict in Syria in the past. In August 2015, Iranian reporter Mohammad-Hassan Hosseini suffered facial injury in a mortar attack by militants in the port city of Latakia in western Syria. Press TV correspondent Maya Nasser was also killed in September 2012 after militants attacked Press TV staff in the Syrian capital, Damascus. On Saturday, Syrian forces regained control of areas in and around Aleppo, which were seized by foreign-sponsored terrorists over the past two weeks. The so-called Syrian Observatory for Human Rights said that the army had retaken a couple of strategic areas such as the neighborhood of Dahiyat al-Assad and the village of Minyan on Aleppo’s outskirts. “We fought them in every street, house, neighborhood and schools, and they used mosques to launch attacks,” an army brigadier general in Minyan who identified himself as Nabil told Lebanon’s al-Manar TV. Aleppo, once Syria’s second largest city, has been the scene of fighting between Syrian forces and terrorists. It has been divided over the past four years between Damascus forces in the west and terrorists in the east, making it a front line battleground. Backed by Russian air cover, the Syrian army in September launched operations to reunite the divided northwestern city.